Designer and builder of natural swimming pools, water gardens and fountains uses Oly-Ola Edgings two-inch high paver restraint and six-inch high landscape edging to retain stones, create a finished clean look and support the outside edge of ponds, garden swim ponds and water gardens. Oly-Ola Edgings Inc., a leading producer of commercial-grade 100% recycled paver restraint, landscape edging and roof garden edging products for landscape architects and contractors announces that their Bric-Edg™ paver restraint while Super-Edg™ low-profile landscape edging products have been successfully installed by Robin’s Nest, of Hollis Maine. Bric-Edg™, two-inch high paver edging, is used to retain stone as well as create a clean look and finish. Super-Edg™ is a six-inch high landscape edging that supports the outside edge of ponds, garden swim ponds and water gardens. “Stones are a key component of our water feature installations. To keep filter stones firmly in place and prevent any moving or shifting out of the perimeter filter zone, we use Bric-Edg, a two-inch high "L" shaped paver restraint, on the inside edge of the filter. It is constructed of heavy-duty and 100% recycled polyvinyl chloride (PVC) which makes it strong and durable,” states Christopher Paquette, Owner, Robin’s Nest, LLC. Featuring a 6 inch deep low-profile design and heavy-duty, 100% recycled PVC construction, Super-Edg provides an ideal support for pond edges. “We’ve spent years trying to come up with a pond edge support that doesn’t allow water to wick out of the pond, and doesn’t have to be an aesthetic (viewable) component of the edge of the pond. The water line on any body of water is a critical component to the eye as well. An even more important aspect of edge control for water features is ease of inspection for any edge leaks. Super-Edg solves a lot of these problems: the edge holds the liner solidly in place, maintains a firm level across the plane of the water line, and can be easily inspected for low spots. On top of all this, it locks in and blends the edge of the liner into the landscape without showing more than a ¼ inch of liner along the pond’s edge,” continues Christopher Paquette. Robins Nest, LLC, located in Hollis, ME designs and builds natural swimming pools, water gardens and fountains and provides customers with over 21 years of expert "how to" advice for building water environments. Robin Nest’s habitats use naturalized design techniques to obtain healthy, swimmable water that is not destroyed by chemicals, but rather, enhances its natural surroundings cohesively. After years of trial and error, they developed a creative and useful method of retention, the “Filtered Edge”. 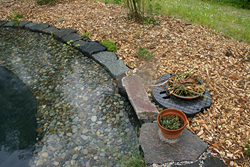 The “Filtered Edge” is a more natural approach to pond health and design and works so well even small water gardens are built with a filtered edge. For almost four decades, Oly-Ola, Edgings, Inc. has been producing the most complete line of vinyl paver restraints and polyethylene and vinyl landscape edgings in the landscape industry. Constructed of strong 100% recycled materials, Oly-Ola has 12 different restraint and edging styles available. Oly-Ola offers the industry’s strongest and most comprehensive guarantee, hassle-free shipping, fast delivery and products that are sold exclusively through landscape distribution centers, landscape contractors, architects and independent nursery/garden centers. All edging products are made in the USA. Oly-Ola Edgings, Inc. 124 E. St. Charles Road, Villa Park, IL 60181.